Naumburg is a town on the Saale River roughly in between Leipzig and Jena. 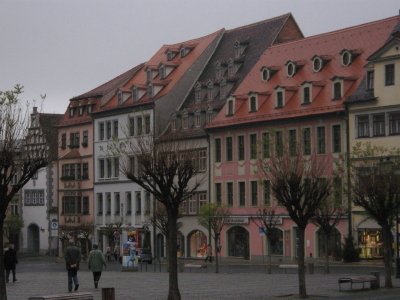 It was one of the important bishoprics during the Medieval history of Saxony, serving as a base for the evangelism of the Sorbians. In 1142 it received town rights. During the Reformation times, it was tossed back and forth between the Ernestine and Albertine lines of Saxony; in 1565 popery was banned once and for all, though the motives of Augustus may have had more to do with his own political scheming than religious purity– he had appointed his eight-year-old son as administrator in lieu of appointing a new bishop. 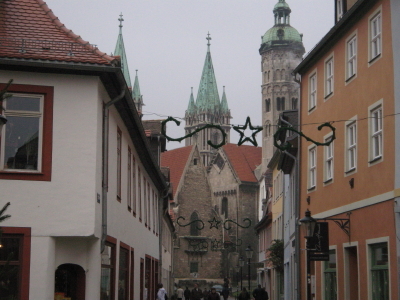 I stopped in Naumburg on a peradventure, on the way to Jena. It proved to have many charming sights, and would be worth adding at least a half-day to anyone’s itinerary to check it out. 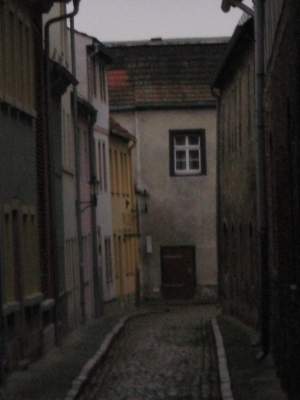 Naumburg is also the town that Nietzsche grew up in. His house has been, supposedly, preserved and made into a museum. For those with an interest in philosophy or Wagner, it may be worth seeing. Yes now that you mention it I remember signs to this, though I couldn’t find it. It was Christmas day and so would have been closed anyhow. Something for me (and all of our readers) to bookmark for the next trip.